De Tomaso is an Italian car manufacture that produced the Vallelunga ’64 – ‘ 68, the Mangusta ’67 – ’71 and the Pantera from ’71 – ’91. 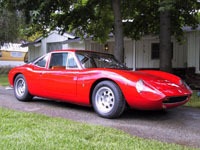 All of these cars were Rear mid –engine designs but De Tomaso also had special single seat race cars and developed prototypes in front engine and rear engine designs. De Tomaso was founded by former Formula One driver Alejandro de Tomaso in Italy in 1959. The Vallelunga which slightly resembles a Ferrari designs of the period, was designed by De Tomaso and built by Ghia in small numbers. With a 1.5 liter Ford Cortina 4-cylinder engine producing 105 HP 4-wheel independent suspension and 4-wheel disc brakes the Vallelunga only weighed 1,600 lbs. Only 53 were built and good to average condition cars have sold for as much as $100,000. The Mangusta, Italian for Mongoose “The Cobra Killer” is a phenomenal performing mid engine car powered by a Ford 289 V8 engine in Europe and a Ford 302 V8 engine in the US. The 289 put out roughly 305 HP while the 302 put out 220 HP due to US emissions standards. All cars had a 5-speed ZF transaxle 4- wheels disc brakes and front and rear independent suspension. Weighing 2,600 lbs the 289 CID version was capable of 160 MPH. Considering the Mangusta came with power windows and air conditioning one could conclude that a ‘lightened” Mangusta could have been a top performer. 401 Mangusta were built and an average condition Mangusta recently sold at RM just short of $76,000. The Pantera replaced the Mangusta and was more refined for export to the US. Power by a Ford 351C producing 380HP and also utilizing the 5-speed ZF transaxle that was common to the Ford GT40. Ford imported and sold Pantera’s in the US market up to 1975 having sold over 5,500. 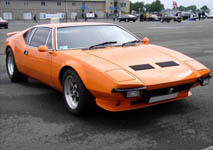 De Tomaso continued to build the Pantera and export around the world eventually replacing the 351C with the more powerful 302 CID 500 BHP V8 engine. In all roughly 7,200 Pantera’s were built. An average un-restored car can be acquired for as little and $30,000, with well sorted version going for $80,000. De Tomaso was dissolved in 2004 and Alejandro de Tomaso passed away in 2003, but his legacy lives and the car world is that much better for his contributions.